Empress Go-Sakuramachi (後桜町天皇, Go-Sakuramachi-tennō, 23 September 1740 – 24 December 1813) was the 117th monarch of Japan, according to the traditional order of succession. Go-Sakuramachi's reign spanned the years from 1762 through 1771. This 18th-century sovereign was named after her father Emperor Sakuramachi and go- (後), translates as "later"; and thus, she could be called the "Later Sakuramachi". The Japanese word go has also been translated to mean the "second one;" and in some older sources, this empress might be identified as "Sakuramachi II". In the history of Japan, Go-Sakuramachi was the last of eight women to take on the role of empress regnant. The seven female monarchs who reigned before Go-Sakuramachi were Suiko, Kōgyoku (Saimei), Jitō, Genmei, Genshō, Kōken (Shōtoku), and Meishō. 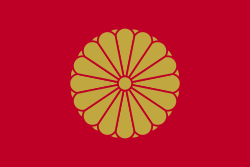 Before Go-Sakuramachi's accession to the Chrysanthemum Throne, her personal name (imina) was Toshiko (智子); and her initial pre-accession title was Isa-no-miya (以茶宮) and later Ake-no-miya (緋宮). She was the second daughter of Emperor Sakuramachi. Her mother was Nijō Ieko (二条 舎子). 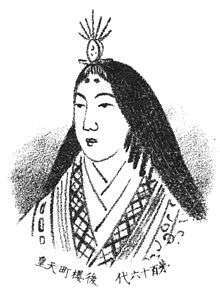 Her older sister died young, and her younger brother was Emperor Momozono. The empress and her emperor brother were the last lineal descendants of Emperor Nakamikado. Empress Go-Sakuramachi's Imperial family lived with her in the dairi of the Heian Palace. Princess Toshiko acceded to the throne when Emperor Momozono abdicated in favor of his sister. Momozono's son, Prince Hidehito (later to be known as Emperor Go-Momozono) was only 5 years old at this time. Hidehito's empress aunt was expected to occupy the throne until her nephew would be able to take on the burden of responsibility. 23 September 1740: Princess Toshiko was born into the Imperial family. 15 September 1762 (Hōreki 12): Accession as Empress Go-Sakuramachi upon the abdication of her brother Emperor Momozono. 1763 (Hōreki 13): A merchant association handling Korean ginseng is founded in the Kanda district of Edo. 1765 (Meiwa 2): Five-momme coin issued. 1766 (Meiwa 3): The Meiwa incident involved planning and other activities which were intended to displace the Shogunate with restored Imperial powers; but the attempt was thwarted. 1768 (Meiwa 5): Five-momme usage halted. 1770 (Meiwa 7): A typhoon flattened the newly built Imperial Palace in Kyoto. 1770 (Meiwa 7): A great comet (Lexell's Comet) with a very long tail lit up the night skies throughout the summer and autumn. 1770 (Meiwa 7): Although no one could have known it at the time, this was the first of 15 consecutive years of drought in Japan. 9 January 1771: In the ninth year of her reign, the empress abdicated in favor of her nephew; and her reign came to an end. Go-Momozono's reign did not last long, ending in 1779 when Go-Momozono died without leaving a son. When her nephew was dying, the then-retired (Daijō Tennō) Go-Sakuramachi consulted with the senior courtiers and imperial guards, planning to accept Prince Fushimi-no-miya as an adopted son, but they eventually decided on Prince Morohito (師仁), sixth son of Prince Kan'in-no-miya Sukehito (閑院宮典仁), who was supported by the emperor's chief advisor (Kampaku). Prince Morohito, hastily adopted by Go-Momozono at deathbed, became Emperor Kōkaku. After the throne had switched to that branch of the imperial line, Go-Sakuramachi, in her role as Retired Empress, came to be referred to as the Guardian of the Young Lord (Emperor Kōkaku). In this role, in 1789, during a scandal involving an honorary title, she admonished the Emperor. Although there were seven other reigning empresses, their successors were most often selected from amongst the males of the paternal Imperial bloodline, which is why some conservative scholars argue that the women's reigns were temporary and that male-only succession tradition must be maintained in the 21st century. Empress Genmei, who was followed on the throne by her daughter, Empress Genshō, remains the sole exception to this conventional argument. The empress is credited with creating a book called Matters of Years in the Imperial Court (禁中年中の事, Kinchū-nenjū no koto). The work consists of poems, Imperial letters and Imperial chronicles. 24 December 1813: The former empress died at the age of 73. Go-Sakuramachi's kami is enshrined in the Imperial mausoleum (misasagi), Tsuki no wa no misasagi, at Sennyū-ji in Higashiyama-ku, Kyoto. Also enshrined in this location are this empress's immediate Imperial predecessors since Emperor Go-Mizunoo – Meishō, Go-Kōmyō, Go-Sai, Reigen, Higashiyama, Nakamikado, Sakuramachi and Momozono, along with her four immediate successors – Go-Momozono, Kōkaku, Ninkō, and Kōmei. The years of Go-Sakuramachi's reign are more specifically identified by more than one era name or nengō. ↑ Ponsonby-Fane, Richard. (1959). The Imperial House of Japan, p. 120. ↑ Titsingh, Isaac. (1834). Annales des empereurs du Japon, pp. 419–420. 1 2 3 Titsingh, p. 419. ↑ Brinkley, Frank. (1907). A History of the Japanese People, p. 621. ↑ Meyer, p. 186; Titsingh, p. 419. ↑ Screech, T. Secret Memoirs of the Shoguns, pp. 139–145. 1 2 3 Hall, John. (1955). Tanuma Okitsugu, 1719–1788, p. 120. ↑ "Life in the Cloudy Imperial Fishbowl," Japan Times. 27 March 2007. ↑ Ponsonby-Fane, Richard. (1959). Imperial House, p. 423.